So you traded your left kidney, your bijon frisé, your 1972 Chevy Nova and your soul for a World Series ticket.I have three questions for you: 1. What are you doing with a bijon frise? 2. Are you looking to save a few dollars once you finally make it through the turnstiles? and 3. Do you really want to spend the first two innings waiting in the beer line? If your answers to those three questions were “it was my wife’s idea,” “yes,” and “no,” then you’re in luck. Hundreds of companies are finding new and creative ways to smuggle booze into the nation’s sporting and entertainment venues – they’re 21st-century bootleggers, whose ingenuity is worthy of Nobel Prize consideration. Eat your heart out, James Bond. You may have a shoe concealing a poisoned dagger, but we have sandals with bottle openers on the sole and a secret compartment in the heel for transporting a few precious ounces of your favorite liquid refreshments. Heck, there’s even the “Beer Belly,” a contraption with a sling and a bladder that fits over one’s stomach and conspicuously under one’s shirt. 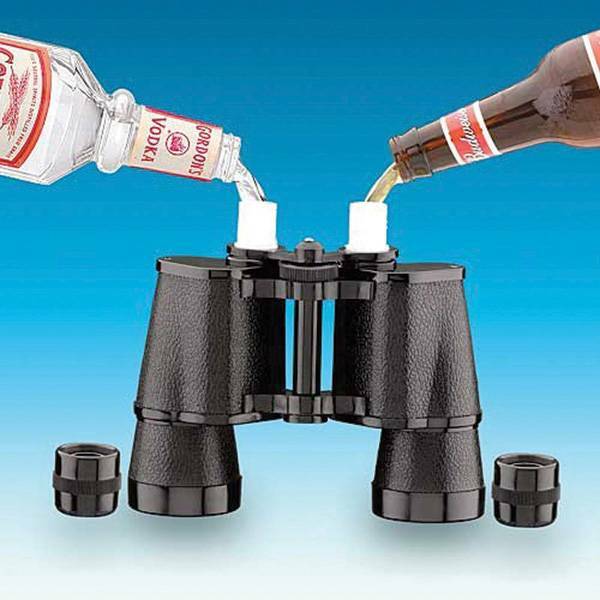 This could quite possibly be the greatest invention since the beer helmet. Think of it as a frat boy’s CamelBak – English lit will never be the same. One word of advice: Fill the bladder with hot chocolate on a cold October night, or with margaritas for a spirited seventh-inning stretch and you’ll make friends with all of section 405. Just don’t mention where you hid the salt and limes. There’s another creation that piques my interest, one that brings new meaning to the term “double vision.”No security officer would think to stop a man walking through the gates wearing a pair of binoculars around his neck. How would he know these binoculars are actually concealing 8 ounces of spirits in each eyepiece? It’s an idea so ridiculous, yet so ingenious – you’ll be more popular than the cotton-candy guy. The “barnoculars” drew rave reviews during Managing Editor Rick Carroll’s recent field test in Bayou country. It made the standard flask look like the Model T of concealed drinking devices. And it makes quite a statement. Wear these barnoculars around your neck, and you’ll let everyone know you’re practical and a tad unpredictable. You’ll let everyone know you’re ready to party at a ballgame, a trip to the ballet, a chick flick or a whale watch. And nothing says baseball like Cracker Jacks and a gin and tonic.Don’t bother trying to adjust these binoculars – if the image is out of focus, they’re working. You won’t be able to see Troy Tulowitzki turn a double play – but hey, after 16 ounces of liquor, I’d be happy if I could find my parking stub or my car.What’s next? A seat cushion that doubles as a blender? An umbrella that dispenses pigs in a blanket? The possibilities are endless.And I thought my soda-can coin bank was impressive.